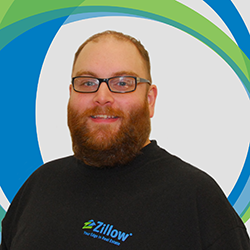 This week, we're showcasing Associate Account Manager Hunter Shellhase. Hunter has been working here at Mortech for almost 2 years. He has two children with his wife Kren: 5 year-old daughter Presley, 1 year-old son Devny, and their 15 year-old black cat Lilabet. Favorite things to do on his days off: When I'm not entertaining my kids I like Husker football, poker, bocce ball, biking, board games, entertaining guests and working in my shop. Favorite place to travel: Jamaica. Favorite time of the year: Football Season. Favorite thing about working at Mortech/Zillow: Employees are treated as a valuable asset. It gives us the pride and motivation to exceed expectations and take big swings. Favorite feature of Marksman: I think Ratetracker is awesome. I wish I knew a tool like this existed when I was shopping for a mortgage. Marksman Insider Tip: Don't forget to add your personal touch. Taking one minute to configure a branded message into your email campaigns and Ratetracker is key to providing your customer the most valuable experience.